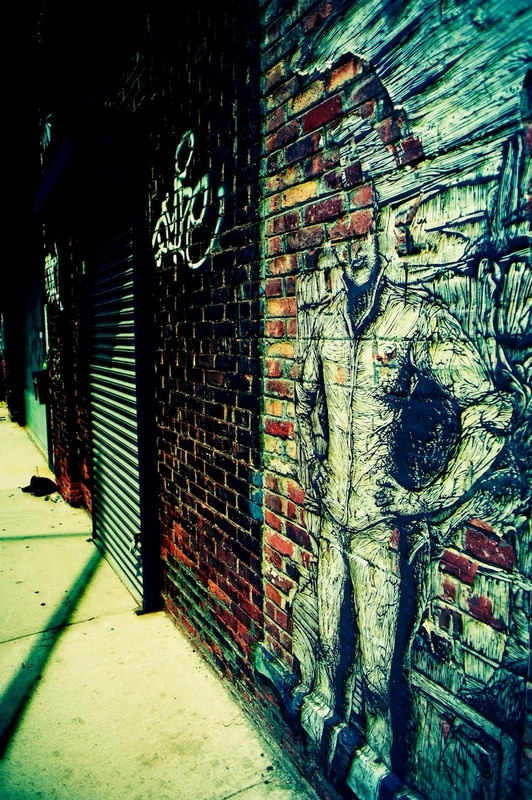 Partially exposed graffiti on a wall in hipster central – Williamsburg, Brooklyn. With part of the subject’s head missing, it is almost the closest thing I have to a Halloween image. I actually had some other images lined up for today and for the lead up to Halloween, but chose not to use them. Several weeks ago there was a vicious storm. Where I live it manifested as a micro-burst with 150 mph winds. It’s biggest effect was on the neighborhood trees. My neighborhood also has a lot of cemeteries. Combine both of those with my new infra-red camera and black-and-white conversions, and I had some strong Halloween images. But I decided not to post them, at least for now, out of respect. I’m not against cemetery images, and I don’t even necessarily think it’s inherently wrong to turn a cemetery scene into a Halloween image. But right now, for me, it didn’t seem right. There are people buried there, and in my images their names were easily discernable. I could have smudged or blurred them but that wold have hurt the realism of the images and destroyed the very effect I was trying to create. Maybe I will publish them in a different ime of year when the dopey Halloween theme is not so prominent. I’m not sure. I’m not explaining this well. I tried explaining it yesterday while chatting to Eric of Digital Silver Imaging, the company through which I obtained my infrared camera conversion, at PhotoPlus Expo, and I know I failed to explain it to him, also. But there it is, for better worse. Let me tell you something else I did not do today which is a little odd. I woke up early and drove into the city with the purpose of taking pictures, and did not take any. I just didn’t feel like it. I had looked forward to it since I started planning it around mid-week, but from shortly after I woke up I just didn’t want to do it. I probably should have gone back to bed, but giving in to that temptation is very dangerous for future early morning excusions, because I always want to go back to bed in the morning. This was the first time ever that I got out “in the field,”, and decided to pack it in. I’ve never felt this way before, and thought about pushing through and making myself take some shots. There is a reasonable chance that once I got started I would have enjoyed the process. But precisely because this feeling was so rare, I decided to go with it. This is a hobby, that I love, and I do not ever want it to be a burden or chore. I’m already looking forward to my next photo walk so I think I did the right thing. Yes, I missed some shots today, but there are more to come. So, finally, back to the shot above. It was taken during the same photowalk as all of my previous Williamsburg images. It was 5 exposures, hand held. I processed mostly in OnOne Photo Tools, in honor of my meetup yesterday with OnOne’s newest employee Brian Matiash at the PhotoPlus expo. Brian was working their booth, but took his lunch break when I came by along with Scott Wyden. I added a cross processing filter to generate the odd color tones, which seem appropriate for Halloween. I also added extra grain while in Photo Tools, and used a dark brush filter to darken the left side of the image. Then, however, I still wanted the left side of the image to go even darker, and couldn’t make it happen in OnOne so I reverted to my old favorite Nik Color Efex to add a Neutral Density filter, positioned to come from the left, to achieve the last piece I wanted. I bet OnOne can do the same thing, but I haven’t yet figured out how. Maybe I need to start watching Brian’s webinars. Great find Mark! Wonderful finally meeting you as well! Nicely done. Love the greenish cast!